For many people, it’s not the fact that headphone wires are burdensome to wear. The problem is they can be a hassle to carry. And unless you treat them with the utmost respect, wired earbuds will short within a few months. 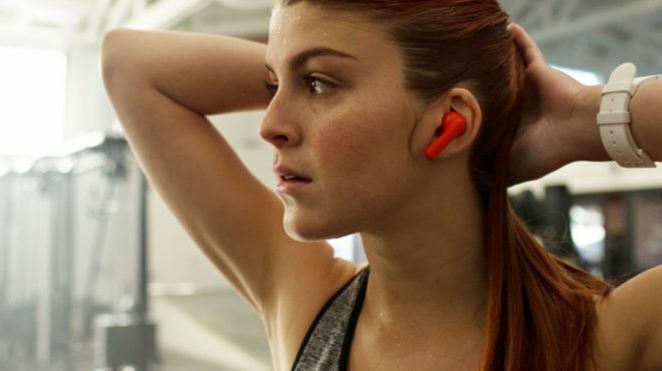 True wireless earbuds eliminate those problems completely. But the design adds challenges of its own. With a truly wireless earbud, you need both buds to sync together, allowing them to play in unison. You need independent batteries for each bud, as opposed to a larger shared battery. Overcoming these kind of issues is at the heart of any search for worthwhile wireless earbuds. Mobvoi TicPods were created by a successful crowdfunding campaign. Any product that’s brought to market by popular demand is going to be at least a little bit interesting. And Mobvoi TicPods are somewhat interesting when you understand what they really are. From a superficial standpoint, they’re a mixture of true wireless earbuds and an athletic-friendly design. 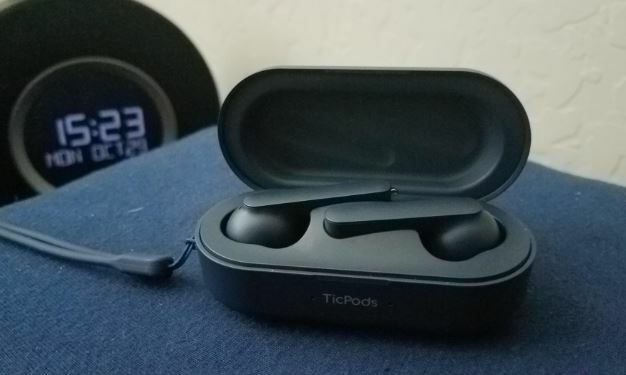 But their charging case allows them to enjoy a greatly extended battery capacity, and they have deep support for calling features which isn’t surpassed by any literally any other pair of earbuds on the market. 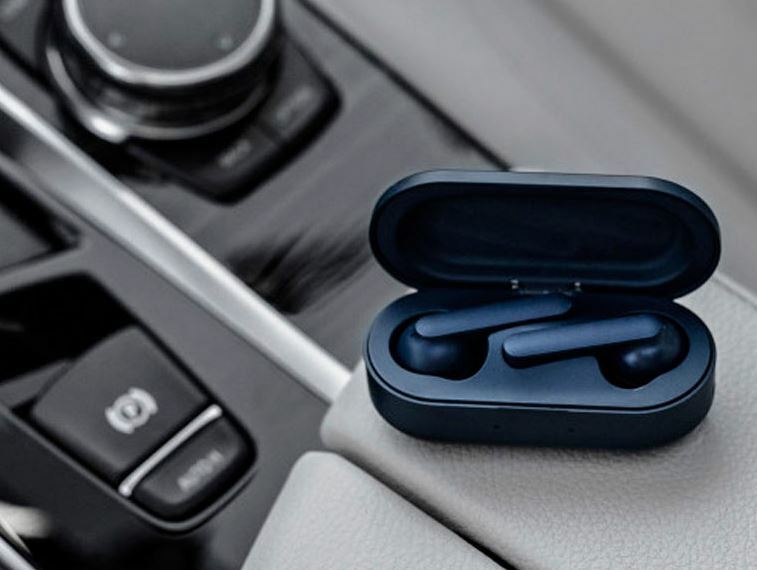 It’s actually small successes in several areas that help the Mobvoi stand out in the otherwise saturated market of wireless Bluetooth earbuds. 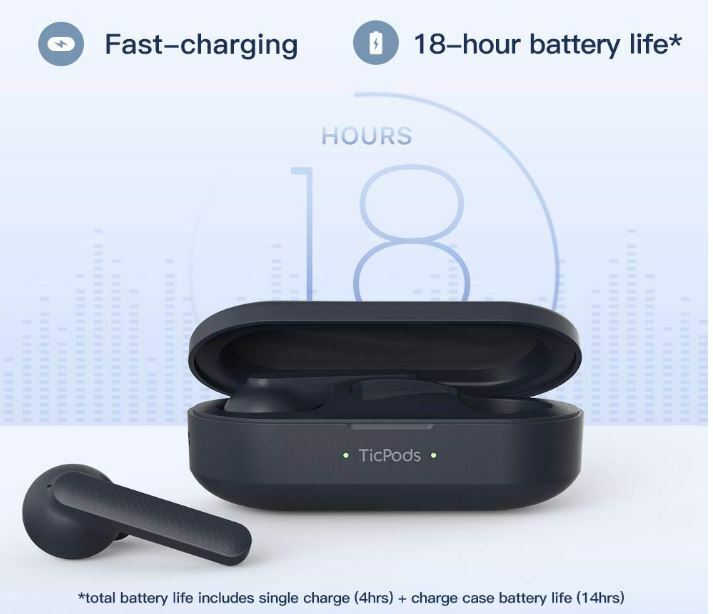 Each TicPod earbud weighs about an ounce, with the entire kit inside the case weighs about four ounces. Each bud has a short antenna extending beneath its central frame. This design may appear largely aesthetic in nature, but an extended antenna allows for a phenomenal connection, as well as more space for each battery. It also provides a little extra space for the touch controls. The touch-button controls are ordinary media buttons, which allow you to skip songs, change the volume, mute calls, and so forth. Because each button has a slightly different tactile feel than the area around it, you can easily differentiate each button without sight, even though they’re both small and close together. The chassis is built with IPX5 protection, which defends the buds against dust, sand, and grit. The earbuds also withstand rain, sweat, and light splashing. They’re basically intended to have the endurance levels necessary to endure athletic activities. Consequently, they can manage just about anything short of taking a dive into a pool. The waterproofing does not protect against submersion. In-ear detection is another feature that helps to distinguish Mobvoi TicPods Free True Wireless Bluetooth Earbuds. That feature is exactly what it sounds like — the buds are aware when they’re inside of your ears. Aesthetically, the TicPods are available in lava orange and navy blue. The navy blue is rather discreet and subdued, not really intended to stand out. By contrast, the lava orange is high-contrast and eye-catching. When it comes to their batteries, Mobvoi TicPods slightly exceed expectations. Each bud is capable of offering about four hours of lifespan. You get an additional 14-hours of playtime from the charging case. That totals to 18-hours of listening once you’ve got the whole set charged and ready. And being able to get through a full day ensures the Mobvoi TicPods are powerful enough for almost anyone looking for true wireless Bluetooth earbuds. But there’s always room for criticism. Some earbuds will give you a connection to your smartphone, to display a detailed battery status indicator. Unfortunately, there’s no special software support to monitor the battery life of these buds. On the base of the antenna for each bud, a tiny LED is your only indication about the status of the battery. It will begin flashing if you’re approaching the end of your charge, and will fill to a solid color when charging has completed. 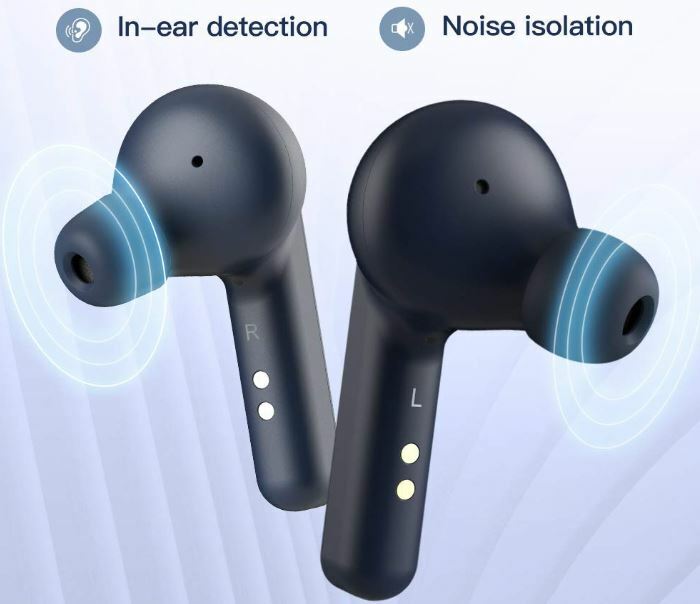 The indicator LED is a common and fairly convenient solution, but software-based battery monitoring has become increasing in vogue, especially among earbuds in this price range. The case feels like it weighs essentially nothing, it actually weighs about two ounces. That’s somewhat surprising considering the powerful battery locked away inside the case. And as you might expect, the color scheme of the case matches the color of each Mobvoi TicPod. The topside of the charging case pops opens with a simple thumb motion. It’s not totally obvious how each bud fits inside the case at first. But with a few minutes to get familiar with the case, you can start inserting the buds almost without looking. Understandably, poor sync between the earbuds can be a deal-breaker for many listeners. Even a minor delay between the left and right bud can be a big problem when you’re trying to watch a movie, or listen to a conversation. But the connection between these two buds is so great, it may as well be wired. However, apart from getting the essentials right, there’s not much to praise about their sound quality. It’s tough to get great audio quality from earbuds. Mobvoi TicPods are best characterized as having a balanced sound. The bass is smooth, though it has the same lack-of-punch that almost any other pair of earbuds suffers. More notably, there’s minimal distortion throughout its design. This allows the sound quality to remain steady, even when you’re listening at lower levels of volume. The sound quality won’t disappoint someone who’s familiar with using in-ear headphones. The treble range provides ample clarity for cinematic experiences, but it’s somewhat lacking for some types of electronic music. As with many earbuds, the Mobvoi TicPods have a slight emphasis on their mid-range. It’s almost as if the Mobvoi TicPods were made specifically for making and taking calls. But it’s not clear if Mobvoi TicPods ever intended to aim for pristine audio quality, their goals seem to lie elsewhere. The ergonomics of each earbud are designed quite well. Though the antenna is lightweight, it acts as a counterweight to help keep the Mobvoi TicPods inside your ears. Once again, apart from doing these basic things very well, there’s not much to celebrate, and equally little to gripe about. When you’re trying to get comfort from in-ear headphones, having plenty of size-options for ear-tips is about 90% of the job. The other 10% is having ear-tips that are made well. But that’s something any decent brand manages to do correctly, and it’s almost a non-issue when you’re looking at headphones above the $100 range. The problem is Mobvoi TicPods Free True Wireless Bluetooth Earbuds only include two sizes of ear-tips. The first size is about normal-average; the second size is large. Those size options ensure about 90% of people will be able to get a perfect fit. Another 5% of people may find a passable fit. That still means the Mobvoi TicPods are not accessible to some people. If you’ve had no trouble finding comfortable in-ear tips before, then the included sizing options will almost certainly cover you. 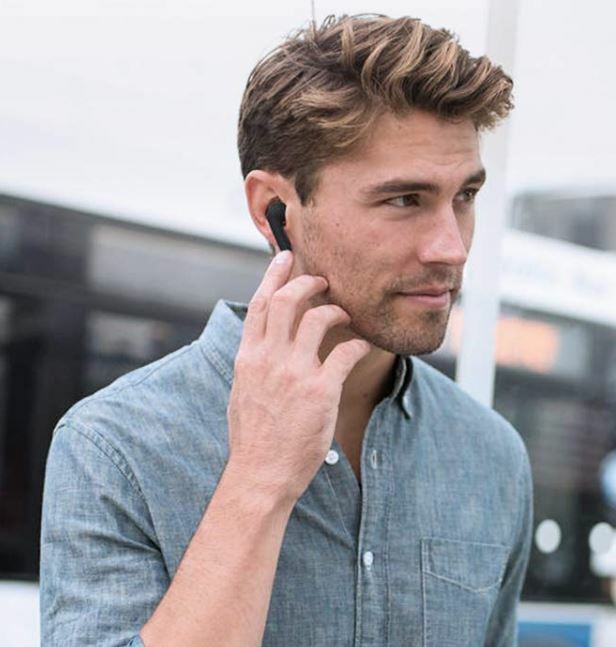 But if you’ve struggled to find the right sizes before, especially because you needed smaller sizes, then you may be among the few who find the size options offered by the Mobvoi TicPods Free True Wireless Bluetooth Earbuds to be insufficient. 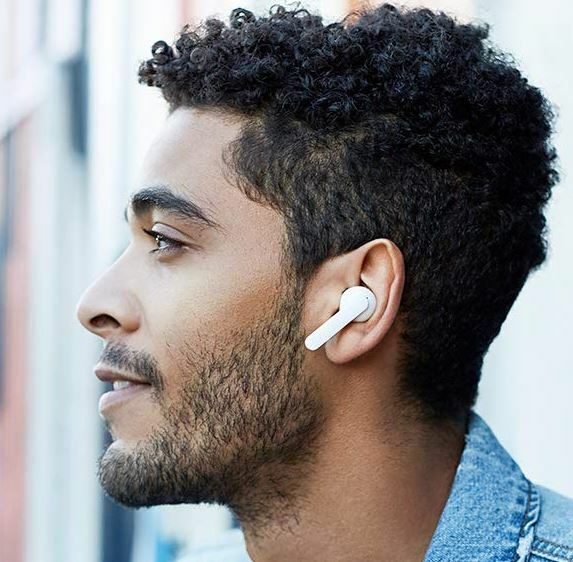 These days, almost any decent pair of earbuds can be configured to work with a voice assistant. The problem is not all of them have native support. Setup and configuration are added steps which are not always welcome, especially for people who are not technologically inclined. Cutting to the chase, Mobvoi TicPods provide native support for voice assistants. Out of the box, you can start asking Siri or Google to take your questions. Essentially every voice assistant you can name finds equal support, and making use of the voice assistant feature is easy. Press your finger against the right earbud, hold it for about two seconds, and you’ll have voice assistant control initiated. From there, you can make calls, receive notifications, and stay in touch as you’re on the move. You can also make use of voice commands, which would depend on the type of voice assistant you were using. Mobvoi TicPods Free True Wireless Bluetooth Earbuds are not ideal for someone with smaller ears. 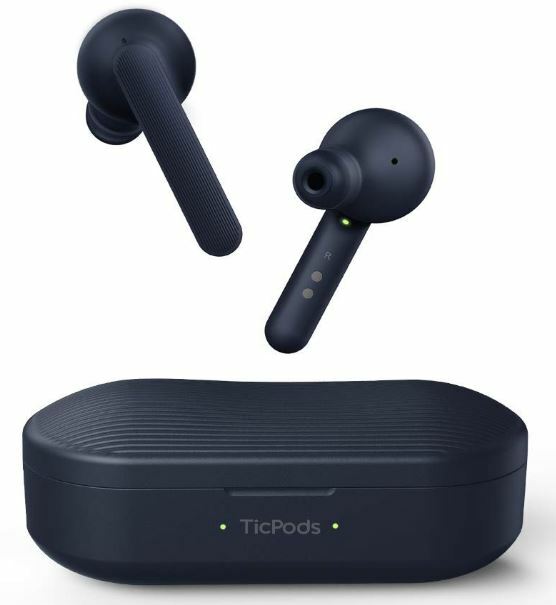 And if you’re comparing them to similar true wireless earbuds, it’s fair to say the antenna design is a bit clunky compared to more discreet buds. If you couldn’t care less about discretion, the extended antenna will help you enjoy a stronger signal and greater battery life than you’ll find on many earbuds around this price point. When you’ve got truly wireless equipment like this, you’re at greater risk for a different type of headphone problem. You can accidentally lose one of the buds, causing you to need a replacement. But if you can manage to not lose them, it’s fair to estimate about three years of heavy daily use before you’ll need to think about replacement. Because the case is so small and lightweight, it’s not too difficult to keep both earbuds together. But it’s something to keep in mind. In addition to the case, this kit includes a one-year warranty from Mobvoi. Who Should Choose Mobvoi TicPods Free True Wireless Bluetooth Earbuds? Though not specifically made for athleticism, each earbud provides the secure fit and the durability necessary for listening on-the-go. Each earbud has roughly 20% more battery life than similar true wireless earbuds. And combined with the slightly above average performance of the battery within its case, these earbuds live up to higher levels expectation. They’re smartly designed, with a slight emphasis on call support and call clarity. Though they could contain more features, relative to their price, the Mobvoi TicPods present a high value opportunity for a certain type of listener. They’re a particularly good choice for someone who values native voice assistant support, great battery life, and having certainty the earbud won’t pop out of your ear.